As writers, we all know how hard it is to cut through the dense, impenetrable jungle of publishers to find the right person who is interested in taking a look at our book proposal or manuscript. I recently attended my second Literary Speed Dating in Sydney organised by the Australian Society of Authors (ASA). 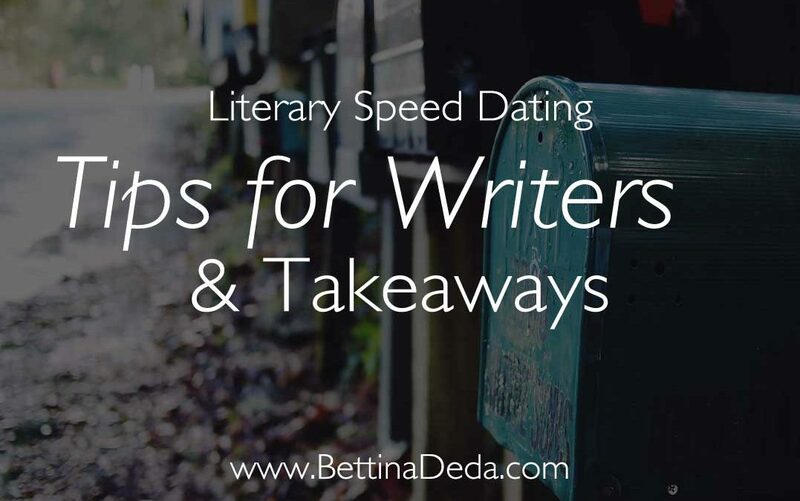 Last year, I summed up my 3 Things I learned from my First Literary Speed Dating. This year, I was again well prepared with a list of the publishers I wanted to talk to and five folders with my book proposal, my publishing credits, and a sample chapter. The event took place at the same location as last year. As a consequence, I felt much less nervous than in November 2016. It also played to my advantage that I knew how the room would be set up, how the event was organised and what the best strategy was to get the chance to speak with all the publishers I had selected. What usually happens is that there are many authors, who want to speak with the bigger publishing houses first, which means that many people run to their tables for their first pitch. Naturally, within seconds, there are long queues in front of those tables. I had noticed at the event in 2016 that it could be to your advantage if you first approach the smaller publishing houses or those who are not your main priority. This is your chance to practise your pitch a couple of times before you talk to the publisher you would love to take on your manuscript. Plus, during the event, the queues vary in length. And instead of wasting precious time in a long line, I always looked for the shorter lines where I would spend less time waiting. This year, my goal was to pitch a non-fiction book proposal. As there was one agent in the room, who accepted non-fiction titles, I started with her to practise my pitch. Although my idea did not work for her list, I had the opportunity to introduce myself and see how my pitch would land with her. When I was finished, I went straight to a smaller publisher with only one person waiting in front of me. So within the first ten minutes, I had already ticked off two people from my list. The next line I joined was a bit longer, but I had only three more publishers to meet, so therefore I didn't worry too much about it. Once I was finished with this publisher, I lined up for the table with two ladies from Allen & Unwin. To my surprise, one of them had no one waiting, so I approached her first. Then, for the last pitch, I had to wait for another 15 to 20 minutes, but I was well on time before the ASA closed the lines for each of the tables. I managed to finish my pitches before the end of the event and was quite happy that I had reached my goal for the day: to go home with four personal contacts to publishers who were interested in reading my work. After this second Literary Speed Dating experience, my advice for any writer and aspiring author is to book these events when they are announced (they usually sell out in a flash), even if your manuscript is not finished or you only want to sound out some publishers for a book proposal. No matter what answer you will get to your pitch, you will have made a personal contact with a publisher for future reference. For me, these personal contacts are the most valuable thing you can take away from such an event. Because what they allow you is to contact these publishers directly when your manuscript is ready or if you plan to pitch a new book in the future. In the past couple of years, I contacted one publisher I had met previously at an Open Day at the NSWWC with a question regarding an idea for a book I was contemplating about. He replied to me within a few days. Another contact from a smaller publisher who had moved on to work with one of the big publishing houses confirmed that I could still contact her directly with a project or manuscript. This goes to show that in our tech-dominated world where everyone seems to hide behind emails and text messages, the personal conversation can achieve so much more. By talking to people you have the chance to convey your emotions and your enthusiasm about your book and to lay the foundation for long-lasting connections – with hopefully a published book in the future.